If the weather gets brutally cold out and I want to warm up quickly, I always prepare a delicious hot sip for myself and for anyone who wants one. Tea is almost a daily ritual for my family as I'm sure it is for many of you, but if I want to change things up a bit I make something that is more indulgent. 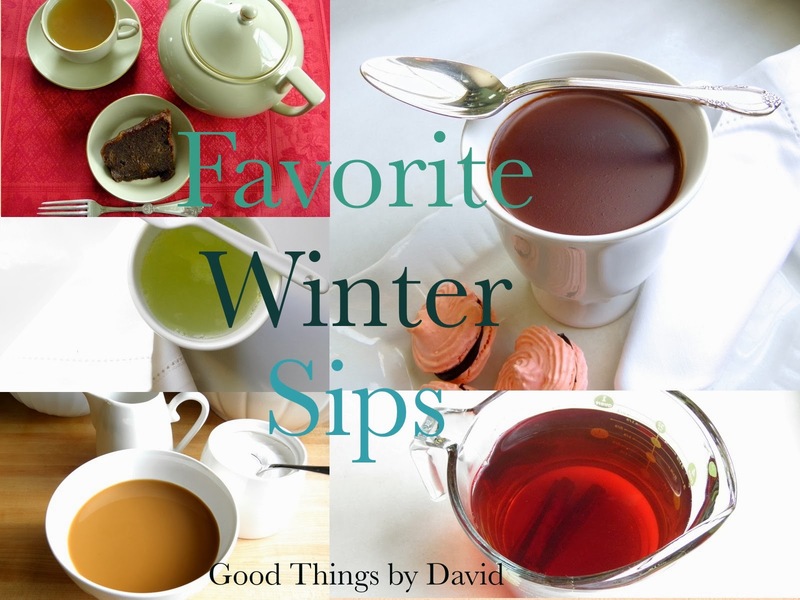 These favorite winter sips of mine are not difficult to make and any of them can be made in a matter of minutes. However, the cinnamon-flavored coffee is one exception, because the spice-infused liquid must steep before it can be brewed into a cup. I'm not sure if it's particularly cold where you are at the moment or if you even need the weather as a reason to make one of these hot drinks. Anything warm to drink is always welcomed in the mornings or afternoons, but some of these favorite sips of mine that don't contain any caffeine can even be made in the evenings. Enjoy one of my favorite winter drinks from a mug, coffee cup or even a cafe au lait bowl. Green tea is my favorite type of afternoon tea. I have a cup or two of it in the middle of the day when I have a moment to sit down and nibble on a cookie, muffin or on the rare occasion, a slice of steamed pudding (above). Whether you make it from loose leaves or from the convenient bags that are available at any market, make sure you warm up the cups first before you pour water to steep the tea. This healthy and delicious Chocolate Oat Bran Muffin paired with a cup of green tea is a good way to start the day. Tea made from the hibiscus flower is usually sweetened, cooled and poured over ice in many Latin American countries, but if you serve the infused liquid while it's still hot, a most delicious drink can be enjoyed. This particular flower can be found as a main ingredient in many herbal teas and it is this which gives them their crimson color. If I want to have a hot drink without any caffeine, I make this natural tea anytime of the day. drop the hibiscus flowers into the pot. Turn the heat off and let the liquid steep for 8-10 minutes. Serve & sweeten to taste. This is perhaps the easiest drink of all. A tart and puckery hot lemon drop is just the pick-me-up one needs when it's cold out. Find a juicy lemon and heat up some water. In no time you will have something that is soothing and refreshing. There is no need to write this recipe down. For every cup of water, juice one lemon and strain it; pour it into a cup. Heat up your water to just under the boiling point and pour it into the juice-filled cup. Sweeten to taste and enjoy! It's that simple. Again, a very simple cinnamon-infused water makes for a comforting sip day or night. For every 4 cups of water add 2 cinnamon sticks. Combine both in a pot and bring it up to a boil. Lower the heat and simmer the tea for 15 minutes. You can serve it at once. This is a favorite drink of my mother's and it's one that I enjoy too. If you want to make a truly delicious coffee the following day, double or triple the recipe and let the liquid cool. Keep it in the refrigerator until you're ready to make some coffee. For cinnamon coffee I strongly urge you to find the best coffee beans and grind them yourself. For this delicious coffee, start with the cinnamon-tea from above. Make sure the liquid has been chilled thoroughly (preferably overnight). Simply pour the infusion into the water reservoir of your coffeemaker, fill the coffee chamber with your favorite java and brew. I like to indulge by putting a generous amount of the coffee into a cafe au lait bowl and adding steamed milk to it. Pure bliss! In my opinion it is imperative to use bar chocolate and cocoa powder in order to make the most decadent hot chocolate. One gives the aroma and flavor, while the other provides sweetness and depth. I wouldn't call it 'ultimate' if I thought it was anything but. Place the dry ingredients in a heatproof bowl. Bring the milk up to just under the boiling point in a saucepan and immediately pour over the dry ingredients. With a whisk, combine every ingredient until the chocolate has melted and the mixture is smooth. Return it to the saucepan and whisk over medium heat until hot, smooth and delicious. Pour the hot chocolate into a generous cup and enjoy. You could serve it with some light meringues or some other cookie if you wish, or you could drop some marshmallows into each cup (homemade of course). I guarantee you there won't be a drop of hot chocolate left after you've taken your first sip. It's that good! I hope everyone is staying safe and warm this winter. Spring is right around the corner, and I for one, can't wait for its arrival. We are rather surrounded by flood waters at the moment, so thinking about drinks is not quite my thing right now, but I wouldn't say no to one of your ultimate hot chocolates!! Amy, I'm sorry to hear that you have flooding in your area! We had a horrible ice storm that knocked power out to over 500,000 customers in our area and our town has been a disaster area for days. Our family had to leave because of this. 3-4 days without power is not fun, believe me. Keep warm and stay safe Amy! I'll be thinking of you. Perfect timing, David, as we are in the subzero wind chill warning area. Oh my; it's positively frigid here in Iowa! You can bet I'll be treating myself and my hubs with one or more of the tempting sips! Hoping you were able to return home to no disasters. Stay warm, Nancy. Those temps are not fun at all. As of 2/8 this morning our home is still without power. We hope to be returning to it as soon as it does. Oh, David!! As I read your post I decided your Lemon drop tea would be my favorite... Then you mentioned chocolate and I was a goner!! Take care and thank you again for another beautiful post! Hopefully, we'll be back by tomorrow. Enjoy the Hot Lemon Drop!! It's good! Beeing a nutrition physiologist though, I just have to mention that consuming larger amounts, over time, of cassia cinnamon can potentially damage your liver. This is due to cassia cinnamon's high levels of coumarin. Make sure to use ceylon cinnamon, wich contains way less coumarin. Luckily ceylon cinnamon is also the better tasting one :) Both spices are commonly found in sale. Like you, I also love tea and have several tea breaks during my day. And this weekend I went to Edinburgh, Scotland, where I discovered a black tea infused with spices and chocolate! Sounds a bit weird, but is now my new favourite :) Highly recommended! Hope everything is all right with your property, electricity back and all! Thanks for letting me know about the coumarin in the cinnamon. I'll keep it in mind! One learns something new every single day. Although I do love my cinnamon tea, it's not something I have on a regular basis. Usually around the holidays I'll make myself a few cups here and there. I stick to green tea mostly! The black tea with chocolate sounds wonderful!! And yes, our power is back, thank you!